A nomadic people dwelling in the east of Palestine, against whom the tribe of Reuben was victorious in the time of Saul, seizing their tents and taking possession of their territory throughout the east of Gilead (I Chron. v. 10). The war is described (ib. 18-20) as having been made by "the sons of Reuben and the Gadites and half the tribe of Manasseh . . . with the Hagarites, with Jetur, and Nephish, and Nodab"; and the booty which the Israelites took from the Hagarites was considerable. The Hagarenes are mentioned in Ps. lxxxiii. 6-8 as confederates against Israel. 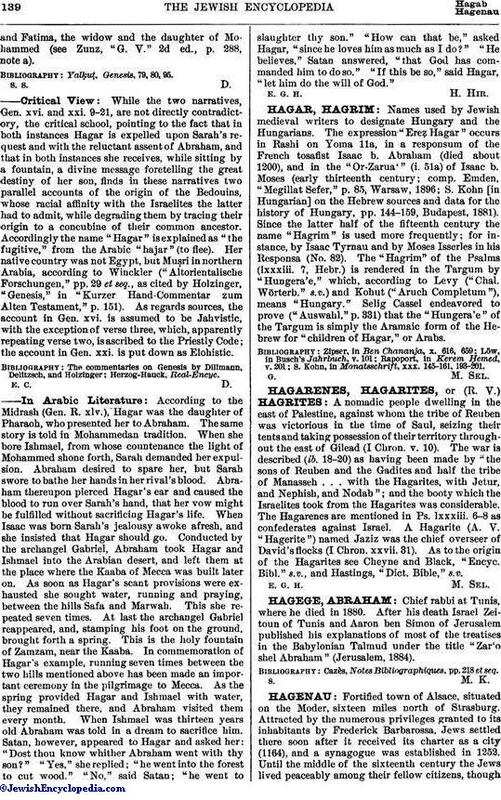 A Hagarite (A. V. "Hagerite") named Jaziz was the chief overseer of David's flocks (I Chron. xxvii. 31). As to the origin of the Hagarites see Cheyne and Black, "Encyc. Bibl." s.v., and Hastings, "Dict. Bible," s.v.